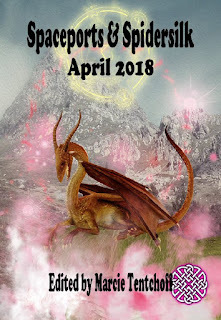 It's still a week until the release of the April issue of Spaceports & Spidersilk, but you can download it now and start reading it today...and it's only 75 cents! Spaceports & Spidersilk features some of the best science fiction and fantasy fiction and poetry for kids of all ages. The April 2018 issue will take you to places you might never have imagined. It will appeal to your inner child, and hopefully take you back to the places you loved as a child…and if you’re still a child, it will open your imagination to all kinds of new worlds. This issue features fiction by: Jessica Marie Baumgartner, Melanie Smith, Tyler Omichinski, Eamonn Murphy, and Maureen Bowden. It also features poetry by: John Grey, Christina Sng, Rebecca Herzog, Pamela Love, and Tamara K. Walker.